Welcome to Koocha, a friendly, cosy escape that brings a taste of Persia to Bristol. Experience plant powered food as you never have before. Vegan or not, you’ll love our fresh, colourful and creative dishes. Step inside for a taste of mouth-watering Persian mezze and a signature gin cocktail. Serving lunch and dinner and everything in between, come visit us for good times and great food! 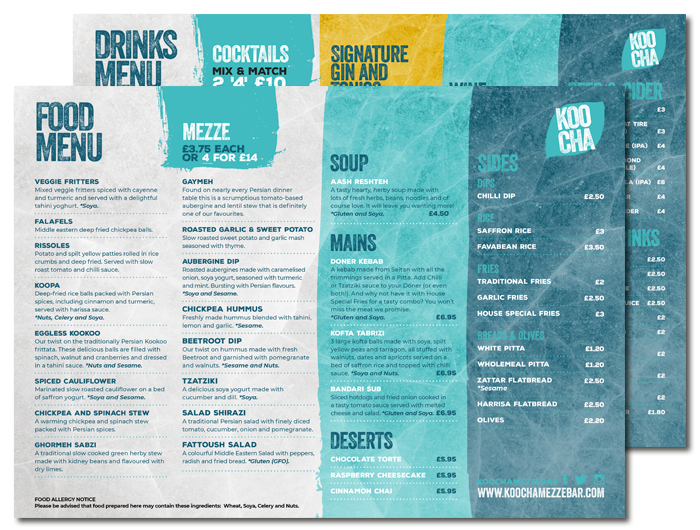 Koocha means corner in Persian; come visit our little corner of Bristol, nooshe-jan! Persian cooking techniques are some of the oldest in history, and yet not widely known. Traditionally the food is spread out on the ‘Sofreh’ so that everyone can have a bit of what they fancy. It’s a family ritual that brings people together, making meal times more fun and meaningful. Koocha showcases the best in Persian cooking with a love of plant-based ingredients for everyone – vegans and non-vegans – to enjoy. Everything on our menu has been designed to taste, try and share with family and friends. 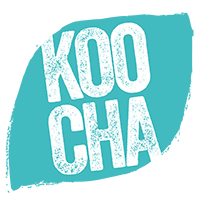 Here at Koocha we are proud of our food and our local suppliers. We like to know exactly where all of our delicious ingredients come from so you don’t have to, and if you do, we can tell you all about it. Our commitment to sustainability runs from the carefully selected ingredients we source to the way we work and serve. Guests can eat, drink and socialise without having to review each detail on the menu, and non-vegans can sample delicious, Persian inspired vegan cuisine. Colourful, creative and filling food brimming with flavour is our thing. Take your pick from our bite-size dishes, best shared amongst friends. Our signature gin cocktails are inspired by the Middle East. The vibrant, diverse city of Bristol is our home and with incredible tastes, sights and sounds right on our doorstep, it’s where we feel most inspired. Come visit our little corner of this amazing city. You can now order food online using Deliveroo! 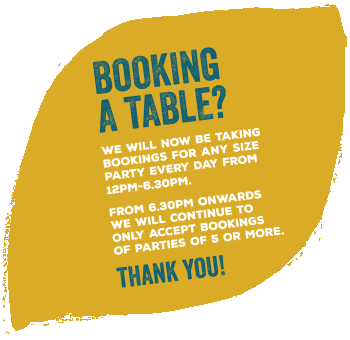 Walk ins are always welcome, but we recommend booking a table for groups of 6 or more.